This past weekend I got to go to LaCrosse with Connor and Justin and stay in Alex's apartment. She is a student at UW-LaCrosse. It was fun to go on a road trip with the boys. We had no major incidents, except when I misplaced my keys at a rest stop. 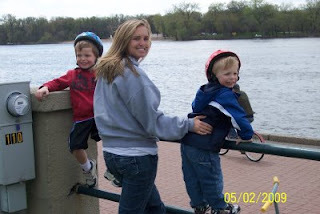 Alex and I took the boys to three parks, to Shopko (my favorite place! ), to Fridays, and back to her place for movies. She even fixed us breakfast. Pancakes. Also my favorite. It is weird to imagine that my daughter will never live with me for real on purpose again. My home will forever be an in-between place for her, as she waits for her "real life" to start. It was fun to step into her world for a little while. Sunday, before we hit the open road to come home I had a chance to meet Heaven, from God's Girl. It was so great to give her a big hug in person. While I wish for an opportunity to actually visit with her in person again instead of squeezing in a few sentences in between yelling at my kids to not get hurt, it was fun. She brought her son and his friend and they all played at the park. My kids were missing daddy and a little high strung by that point of the weekend, but we still had fun. It's kind of crazy when the cyberworld meets the real world. 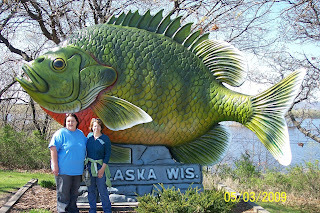 It's good to know that people you like in this bloggy place are people you could see yourself hanging out with for real.